SEATTLE--(BUSINESS WIRE)--Apr. 13, 2015-- (NASDAQ: AMZN)—Have you ever watched a movie or TV show and wondered, “Who’s that guy?”, “What’s she been in?”, or “What is that song?” Never have that problem again. Amazon today announced that X-Ray—a customer-favorite feature since it launched on Fire tablets—is now available directly on your TV screen using Amazon Fire TV and Fire TV Stick. Exclusive to Amazon Instant Video, X-Ray for Movies and TV Shows is powered by IMDb—the #1 movie website in the world, with a database of more than 180 million data items, plus over 200 million unique monthly visitors worldwide. 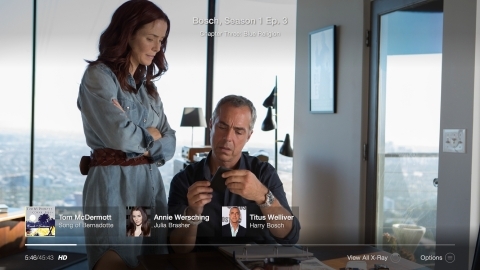 Quickly answer “What else is that actor in?” Binging on the Amazon Original Series, Bosch, and know you recognize the lead actor—Titus Welliver—but can’t quite figure out where you’ve seen him before? Click “up” on your Fire TV or Fire TV Stick remote and find out that he was in Lost, White Collar, The Good Wife and Sons of Anarchy. Dive deeper into your movie and TV-watching experience: Ever wonder about the backstory behind your favorite lead character in a TV show? View background information about the show or lead characters through a simple click of the remote. Find fun-facts from your favorite movies or TV shows: Did you know that Jurassic Park has the most IMDb trivia and goofs captured? With a quick click on your Fire TV remote, you can view movie and TV show trivia and goofs as well as the background music playing in the scene. X-Ray is now available on tens of thousands of titles including Amazon's lineup of award-winning original series like Transparent, Mozart In the Jungle, Bosch and Alpha House,—and on popular Prime member-only exclusives like Orphan Black, The Americans, White Queen, Vikings, Hannibal, Mr. Selfridge and Suits. X-Ray for Fire TV will be delivered to all Amazon Fire TV and Fire TV Stick devices via a free, over-the-air software update starting today. In just one year, Amazon Fire TV has grown selection to over 1,400 apps and games. It offers incredibly accurate voice search, 3x the processing power and 4x the memory of Apple TV and Roku 3, a dedicated GPU, Dolby Digital Plus surround sound, and exclusive Amazon features like ASAP, captive portal support, X-Ray for Movies and TV Shows, and Amazon FreeTime. Learn more about the new X-Ray for Fire TV at www.amazon.com/firetv. Amazon Instant Video offers customers new release movies like Gone Girl, Boyhood and Birdman, and now Star Wars, along with in-season shows like The Walking Dead, Scandal and Better Call Saul to rent or purchase. With Prime, customers have instant access to stream tens of thousands of movies and TV episodes, including award-winning Amazon Original Series, at no additional cost. Prime members can enjoy binge-worthy TV shows including Amazon Original Series’ such as multi-Golden Globe winning series, Transparent, the hour-long drama, Bosch, based on Michael Connelly’s best-selling books, the Roman Coppola and Jason Schwartzman comedy, Mozart in the Jungle and the political comedy starring John Goodman, Alpha House, in addition to HBO favorites like The Sopranos, True Blood and Six Feet Under, and popular primetime series including 24, Covert Affairs, Downton Abbey, Extant, Falling Skies, Grimm, Hannibal, Justified, Orphan Black, Teen Wolf, The Americans, Under the Dome and Veronica Mars. Prime members also have access to an exclusive collection of kids shows now airing including Emmy Award-nominated Amazon Original Series’ Annedroids, Gortimer Gibbon’s Life on Normal Street and the Emmy, Annie and Annecy International Animated Film Festival Award-winning Tumble Leaf, as well as popular shows from Nickelodeon and Nick Jr. including SpongeBob SquarePants, Dora the Explorer, Team Umizoomi, Blue’s Clues and The Bubble Guppies. Customers can watch shows and movies with the Amazon Instant Video app. The Amazon Instant Video app is available on hundreds of devices including connected TVs, Amazon Fire TV, Roku, Xbox and PlayStation, as well as on mobile devices like Fire phone, Fire tablets, iPhones, iPads, and Android devices. Customers can also watch online at Amazon.com/PIV. Prime Instant Video is also the only U.S. online-only subscription streaming service that enables offline viewing—on a plane, on vacation, and anywhere else where you may not have Wi-Fi. In addition to tens of thousands of titles to instantly stream, the Amazon Prime membership (www.amazon.com/prime) includes one million songs and hundreds of playlists with Prime Music, unlimited Free Two-Day Shipping on millions of items, early access to select Lightning Deals, unlimited photo storage, and access to more than 800,000 books, all for $99 a year. Comprehensive cast and crew information, including bios and filmographies, is available on Amazon's IMDb (www.imdb.com).